Thermoworks Thermapen and Oven Thermometer 2012 Giveaway! Almost eight years ago, I did a test with some kitchen thermometers and came to the conclusion that the Thermapen was the best kitchen thermometer money could buy. A few years later, Thermoworks improved on their original design with an even faster thermometer that was also splash-proof. We're pleased to announce that this year, we're giving away one of these excellent Thermapens along with their oven probe thermometer to one lucky reader (valued over $100)! Read on to see how to enter the drawing which will take place on December 1, 2012. It's a bit embarrasing to admit, but over the years, I've actually purchased a whole bunch of these Thermapens. I never wrote up a review of the "new" Splash-Proof Super-Fast Thermapen, but I've found it awesome. In my tests of the original Thermapen, I found that it beat the manufacturer's claim of 4-second readings consistently (it registered the correct temperature in both ice cold and boiling water in about three seconds). The new Thermapens carry a manufacturer's specification of 3-second readings and I can confirm that it is a bit faster than that in my everyday usage. When I say "everyday usage", I really do mean it. Whenever I cook a roast or grill a steak, the Thermapen comes out to ensure I've hit my target temperatures. When I'm baking bread, I stick the bottom with a Thermapen (200°F is a good rule of thumb although some breads are done at a slightly lower temperature than that). If I'm supposed to stick a toothpick into a cake to determine if it's done, I use a Thermapen instead (why not get the temperature for future reference?) so I know far I am from being done if the crumbs are still damp. No joke - when I travel and I know I'll probably have to cook, I travel with a Thermapen. Usually, I can find ample cooking supplies (adequate pots, pans, spatulas, spoons, ingredients, etc. ), but it's unlikely I'll find a fast and accurate thermometer - so I bring my own. The other thermometer we're giving away (together with the Thermapen), is Thermowork's Original Oven Alarm/Timer which is excellent for tracking the temperature of long cooked meats such as roasts (prime rib is a perfect use) and barbeque. Just set a target temperature, stick the probe into the roast, put the roast in the oven with the cable trailing out to the thermometer base and walk away. The thermometer will beep when you're target temperature has been reached letting you know when to pull the roast out of the oven. (I recommend setting the alarm a few degrees lower than your desired doneness so you can allow for temperature rise in the meat as it rests (and the hotter exterior of the roast equalizes with the cooler interior). (These days, I don't use a probe thermometer like this one when preparing my roasts. Instead, I use a thermocouple probe with a data logger providing real-time temperature tracking with a laptop I keep on the kitchen counter so I can save the data for future use. That's almost definitely over-the-top for most people, so I highly recommend the Thermoworks Original Oven Thermometer for people less "crazy" than me.) Oh, and it doubles as a kitchen timer. I use kitchen timers even more than thermometers (and often several at once), so having another one in the kitchen is a great help. I'll number the participants and generate a random number which will determine the winner and post the winner as well as contact them via email. If there is no response within 72 hours of my email, then I'll probably pick another number and winner (and so on). 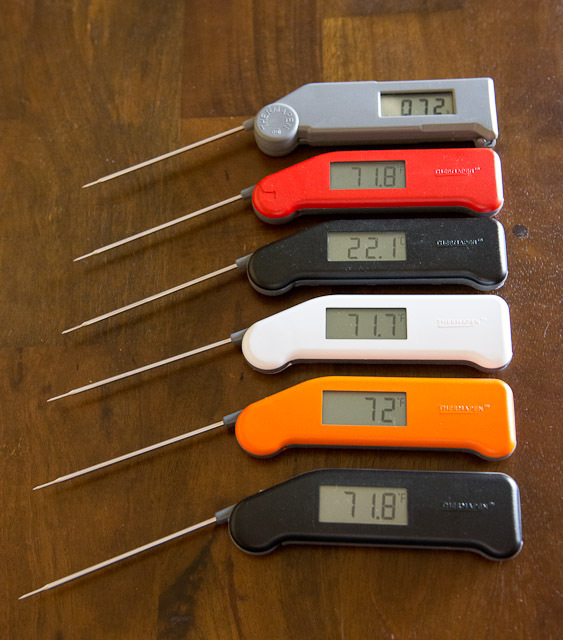 I'm running the giveaway until December 1, 2012, so the new thermometers should arrive in time for Christmas (for your perfect holiday prime rib). Good luck everyone! It has come to my attention that some people have problems with the confirmation code when making a new account. If you can't get it to work three times in a row (make sure you are incrementing each letter: A->B, etc), then email me with the username you'd like at cooking@cookingforengineers.com and I'll set you up with an account. That way you won't have to deal with the confirmation code again. My favorite page on CfE has to be the Simple Tiramisu recipe. I've made that tiramisu probably a dozen times now, and now when I go to a potluck, people always ask if I'm bringing more of that great tiramisu. The first few times I made it was before I got my electric hand mixer, and let me tell you, whipping cream by hand with a whisk is entirely possible, but it's hard work! I had to make sure I wasn't dripping sweat into the cream. I didn't want people commenting about a hint of saltiness to complement the sweetness. Oh, and I also really liked your review of the Kapoosh knife block. I see those in so many stores, and they look so cool, so I'm glad I read your review before I bought one. I love your spiced hot apple cider recipe, and I make it regularly every fall. So far, no one has guessed the "secret ingredient" (the black pepper) without being told. One of my favorite articles was the knife review you did a while ago. Though my favorite part of the site is the recipe grids. It's just such a great way to show a recipe! I really like the kitchen notes, but I think my favorite recipe was for gravlax. Long ago, I was excited to see that you had done corn bread. It's one of my most frequently used recipes, especially cooked in a cast iron skillet for maximum crust! Subject: roasted asparagus spears ftw! My favorite is the roasted asparagus spears. On the side of a good roast, mmm mmm. I've always enjoyed the recipes and the descriptions, but the one that caught my eye was the Dulce De Leche - a candy from my childhood. I'd have to say my favorite is dark chocolate brownies. So much chocolate! The article that brought me to the site first was the knife review, so I have to count that as my favorite. The knife review was the best, but the thermopen review is what got me to buy my first one. I have bought 4 more as Christmas gifts. They are simply awesome. The knife review, for sure. The articles that brought me to your site were the sous vide ones. I've loved the other articles too. My favorite recipe is the shrimp scampi! an oldie, but a good one .. RIBS!!!! My favorito recipe is Dulce de Leche. You can never go wrong with it! I really like your baggie method for making clarified butter, and I always enjoy the equipment reviews. Ceramic knives. Also the forum post on crockpot mod. all the way back in 2006! I've made the Buffalo Chicken Chili at least half a dozen times in the last two years. Still one of my favorite cold weather dishes. I've always been partial to the peanut brittle. I first stumbled on your site while looking for knife comparisons, and it's still my favorite article. I'm also quite fond of the guide to tempering chocolate. The Classic Tiramisu is definitely my most repeated recipe (followed closely by Shepherd's Pie). However I've never tried the Simple Tiramisu recipe, a mistake I'll have to correct soon. One of my favorites was the Pan Pizza article -- I made that so very many times -- with my first introduction to the recipe summary card format. ... I thought I already had an account, oh so long ago. I would never have considered making Gravlox if I hadn't seen your recipe, plus the many many pages of comments and notes that followed it. It is now a festive staple in our house - I can't make enough of it! I'm kind of a control freak when it comes to meat cooking temperature, these thermometers look amazing!!!!!!! I use the tzatziki recipe all the time. I like the "Boiled water" recipe and this thermometer makes it SO easy! Chef Knives Article I was pulling for the Global. My favourite is the Kitchen Knives article. I also love the format of your recipe cards!! Your comparison of bacon preparation techniques revolutionized my kitchen. So hard to choose, but one I keep coming back to is Buffalo Chicken Chili. My favourite was the Jenis Praline Pecan Ice Cream. Truly the world has never tasted a better flavour! I put my username in Username but it says 'Sorry, but this username has already been taken.' Yea, by me:! So I put DenverDude(codemoney) to get it to work. Temperature control is important! Can't wait to see if I can get my hands on some amazing tools to increase my accuracy! Really liked the knife review. I have just started getting into cooking in the last few months and am looking to get a nice chef knife. Since that post was a while ago, is the MAC still your highest recommended, or are there other contenders? Oh, and I forgot, I really liked your review of ceramic knives! I'm a huge fan of your pan pizza clone that is basically fried in a cake pan. I follow your site via Google Reader and I feel like it has been months and months since you've regularly added new content. I miss it. as an aside, the account signup process is painful. I've been returning to the USDA Beef Quality guide recently. We're trying to buy local, quality meats lately and it's important to be able to "speak meat" when buying direct. Buffalo Chicken Chili, mmmm. Tis the season, I need to make it again. Need a Thermapen so I can make some of that English Toffee for Christmas! I found the site through the An Introduction to Sous Vide Cooking article, which, though I've never been able to actually try it, is still my favorite. I had been looking for the condensed milk fudge recipe for a while (I used to make it as a child and loved it). Imagine my surprise to find it here! Thanks! Thanks everyone! These entries are great. I hope you guys don't mind, but I took the liberty of inserting links to the articles whenever they weren't included so future visitors will be able to easily jump to articles or recipes you guys were excited about. I'm going to try to respond to the comments where appropriate, but I might not be able to do that in the future on this thread since it seems to be growing pretty rapidly and my responses will probably be lost. If you have a question about a specific article, go ahead and post the question there instead of here so it'll be easier to respond to. Wow, I didn't think anyone read those. I should probably carve out some time and write the next article in the series... on food safety. Which one? Oven Baked Spare Ribs or Barbecue Pork Ribs? The asian variation of the oven baked spare ribs has made a reappearance in my own kitchen recently. Tina's made it a couple times in the last few months and loves using the left over sauce/liquid to braise chicken and pig's feet and other delicious goodies. However I've never tried the Simple Tiramisu recipe, a mistake I'll have to correct soon. Oh, you're missing out. The simple one can be just as good (or better depending on your preference) as the classic but is so fast to make. Since that post was a while ago, is the MAC still your highest recommended, or are there other contenders? Yes, the MAC MTH-80 is still my go to chef's knife. If I need a larger one, I reach for a 12-in Forschner I keep in a drawer. At this point, I think it largely has to do with how comfortable the handle feels in my hands as well as the blade being curved just right for my cutting technique. We've had some great guest posts over the years! The thermapen is great for checking the temperature of toffee, but you can't keep it in the pot measuring continuously. It's easiest to stick the probe in once in a while (be careful not to scratch the bottom of the pot too much... those Thermapens are sharp!) and check on the temperature. I've found that once you've made a successful batch or two with a thermometer, you don't need to use the thermometer in the future. The color of the toffee is a pretty good indicator (assuming you are using the same ingredients - especially butter - between batches) of what the temperature range is and toffee is pretty forgiving. Toffee is NOT forgiving if you rush it though, so don't blast the heat hoping to get to the right temperature fast - it will separate into a hard candy and liquid butter fat. I've used your recipe cards for various proteins (brining birds, roasting, grilling fish), pecan pies and a whole lot more. I love the way it's laid out and very clear. I love your careful analysis of different tools (ie: knives... I have a thing for scarily sharp Japanese steel). And while I have lots of articles/recipes that I love(d), I'll list your prime rib roast recipe. It was one of the first major things I learned to cook and while I don't need it much anymore, as it was one that kept me coming back. It's gotta be that one. Did I like your article on cooking bacon because I admired all the research, or because it confirmed my liking for cooking it in the microwave? Subject: Favorite recipe . . .
My favorite recipe, by far, is Cream of Mushroom Soup. I like it, not just because it taught me how to make the soup, but because from that point forward, I haven't purchased canned soup. I've learned it's easy enough to make myself. The first article that led me to your site was the one on cookware materials and heat conductivity of different materials. I really appreciated that someone bothered to explain the "why" behind the benefits of the different materials rather than some brief rehashing of tradition or folklore about which cookware was best. The thermal conductivity diagrams were great. My favorite so far I think was the Meat Lasagna, except I was lazy and used penne to turn it into a baked ziti recipe (which worked out extremely well). The Common Materials of Cookware is what led me to the site, because I was about to register for wedding gifts and was wondering what cookware to ask for. So that is probably my favorite, but I also then read the knife review and was convinced to register for a Forschner knife. I love the bacon trials and have been trying each cooking technique. I'm a big fan of leaving it in a low temp oven for a loooooong time. The Kitchen Scale post was really helpful! Subject: LOVE the flow charted Recipe cards! I have been making Cottage Pie (Shepherd's pie but with beef) since it got posted years and years ago. I love it, and everyone I have ever made it for loves it! 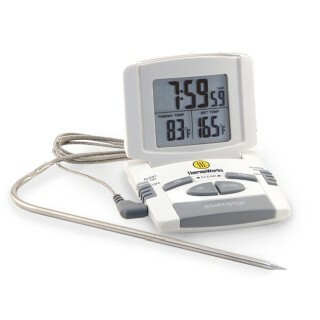 Please post some more recipes so I can use the thermometer I will win by requesting that you post more recipes! Been wanting a thermapen for a while. It's why I desperately want a Thermapen! I enjoyed the knife covers article. Many to choose from, but probably use this Slow Simmered Spicy BBQ Sauce the most! Definitely the English Toffee. I've made this one multiple times, and every time I get compliments and everyone is amazed I made it. Instead of chocolate chips. however, I just use two candy bars (milk chocolate for 1/2, dark chocolate for the other 1/2 of the toffee), and they melt well. The Dulce de Leche is also a winner, and I typically use it instead of frosting for 'Mexican Brownies' - chocolate brownies with 1/2 tsp of cinnamon added to the batter. Subject: I'm new, but count me in! I can't wait to spend some time within this forum. Thanks for the opportunity. Michael, thanks for the site. I've enjoyed it for several years. My kind of perspective. --I'm also looking forward to trying your wife's blog instructions for soap making. Thanks for some enjoyable reading! I first found your site when I was trying to make the perfect soft boiled egg, so your soft boiled egg article is my favorite! It isn't easy to think of a favorite, C for E has been a source of many useful and informative articles, and I've been reading for quite some while. I would love a Thermapen, I still haven't convinced myself to buy one for myself, but I know I want it. I think I really enjoy the cooking tests the most - specifically the bacon articles were awesome. While I use several of the recipes and techniques pages, I think it's the collection of articles on knives that I found most informative. I really appreciate your articles on Thermapens. I have two plus about 5 other measuring devices from Thermoworks. I also bought a chef's knife based on your reviews. The favorite recipie is Traditional Roast Turkey. The food tests are also very interesting. Thank you for the great job. I really appreciate the well written articles on gadgets and cooking tips for individuals who have unique and often under-appreciated way of looking at things...even something as simple as cooking! My favorite recipe is Anghelika's Tsatsiki. Not only is inexpensive and easy to make, it's mad delicious. Whenever I take it to a potluck, I get so many requests for the recipe that I have stored it in my phone and just send it to whoever asks! The recipes are great but what I really like are the experiments. Such as http://www.cookingforengineers.com/article/171/Beer-Can-Chicken for the Beer-Can-Chicken. My favourite post is the one where you can win a thermometer! By far the most mileage I have gotten out of CfE is for the Chicken Marsala. I used to go out to a restaurant all the time just to eat this incredible dish - now I make it at home - Thanks to CfE. The Condensed Milk Fudge is by far my favorite recipe on the site. Instant brownie points with the wife every time I make it. I have not specifically tried a recipe from your site yet but as an engineer I really enjoy it. I like the product reviews. My Favorite article was the soft boiled eggs. Favorite recipes: Ribs, peanut butter cookies. Favorite features: the product reviews, especially the kitchen scales and knives. I stumbled across your website probably about 7-8 years ago when I was looking for a cheesecake recipe (which featured the Thermapen!) and I don't think I've ever used another recipe since. Thanks for the great site, Alton Brown would be proud. Gravlax is the one that I come back to more often. I tried the recipe from Ruhlman's 20 to compare the results, and Cooking for Engineers gravlax came out clearly on top and was less fussy to boot. And I will always fondly associate your Simple Tiramisu recipe with the first time I met you at a food blogger potluck, so I'm going to have to choose that as my favorite! Because there are two, to compare, and because at least one makes great tiramisu. But my favorite post is probably the knife review. It convinced me to buy a swiss army chef's knife -- my best kitchen investment to date. The beer can chicken post was pretty amazing too. The specific recipe that first hooked me I cannot recall, but the layout brought me back, time and time again. Does this giveaway mean that you have plans to post more often to this site? Here's hoping! I bought a set of global knives based partially on your detailed and well-presented review of knives. I really enjoy the recipes and the way you very explicitly lay out the step-by-step processes involved. I love it! I am also loving my knives. They are pretty great. I still remember the first time I came across your website. I was looking into ceramic knives because my boyfriend seemed less that pleased with the one I had. "Not all ceramic knives are the same, babe". Sure, I got mine for free from a friend after she went to Japan because her cousin knew someone who knew someone who sold knives and had extras to give away for some reason, and I didn't know anything about it because the packaging was all in Japanese, and also it probably didn't inspire much confidence being bright pink and glittery - but hey, free knife right?? I've been checking out articles on your site since then. I've learned a lot of my lessons in the kitchen the hard way, so it's really nice when you can break down a cooking process and help me avoid making even more mistakes. The article on tempering chocolate - a must read for any chocoholic!! I found your site iva your chef's knives review. I added the Victorinox knives to our wedding registry and couldn't be happier with them! I love your reviews of equipment and always look things up here before I buy. I would love the Thermopen for cooking precisely. I roast alot and find the timing better with a meter. Thanks for all you do! I love the toffee and microwave fudge recipes, but probably the articles on knives were most useful to me. Thanks!! I love grilled salmon, so I am going to try your grilled salmon recipe and see how it turns out! I'll post a comment there too with my review when I do grill it up! One of the first things I made off of the site, back when I lived in Germany: Shepherds Pie. I still enjoy making it for a hearty dinner! Dulce de Leche because that stuff is delicious, yo. I love checking your site for tips on cooking lots of dishes, but I think my favorite is your approach to making Cheesecake http://www.cookingforengineers.com/recipe/89/Cheesecake-Plain-New-York-Style, which has actually allowed me to make a cheesecake without the dreaded cracked top! I came across your rib roast recipie years ago and have been coming back ever since! I have complete confidence in your equipment reviews, and have saved hours of researching. Thanks! The thermometer has become a best friend. Hope I get another friend named Thermapen! I found this website looking for a chocolate souflee recipe and love the engineering slant. Great website - I love the fact that you present cooking as a science. Fave recipe: Classic Roast Turkey. It's that time of year again. Our fave recipe sp far is the banana bread. My kids and I love the recipe formatting used here...so easy to follow! I do not recall which recipe it was the drew me to this site, but your article on BBQ Ribs is probably my favorite . Michael, enjoyed the Tiramisu receipe and will use decaff espresso ! Also thanks for the Limeade receipe. I think the best review was the first one I read-the temperature probe review. It kept me coming back to read more. I came for the Lemon bars recipe and haven't left. Thank you! Love your microwave recipe for Dulce de Leche. Thanks for offering this great giveaway. Great website! I've only read three articles/recipes/review since stumbling onto the site the other day. 1. Brining 2. Turkey stock recipe and 3. the Thermapen review. All three very informative but my favorite is the stock recipe. Using the multi-pot is a brilliant idea; why didn't I think of that. We just made 12 quarts (used our brew kettle) with the turkey carcass and canned it. We always make more than we'll use in a few months so canning has worked best for us. Plus, if you forget to pull it out of the freezer or haven't planned ahead on a recipe you don't have to wait for it to thaw. Making stock really isn't a difficult task and well worth the effort. But the least desirable step is separating the solids from the liquid. Now making stock will be even easier. The Thermapen review is very helpful and timely because I am in desperate need of a new instant read thermometer for smoking. If I don't win it I'll be buying it. Fantastic website. Keep up the good work. I look forward to getting deeper into the site and forums. I like your method for barbecueing baby back ribs. It's good for those who don't have a smoker and have to use their grill. Subject: It's all about the process. My first visit to your site was ages ago and what impressed me most was the format for recipes! I have converted all of mine to that format and it is so much more efficient. Currently my favorite article is your [u:b519b90130]pecan pie[/u:b519b90130], which I plan on making in the next few weeks for my wife, who loves pecan pie! Your recipe for [u:b519b90130]classic roast turkey[/u:b519b90130] is next on my list, and I plan on trying that at Christmas time. This is a fantastic site with a wealth of information beyond just recipes. All sites on the web should be this thorough. 1. I was making fried chicken. 3. I went to check the temperature again with my Thermapen. As luck happens, often it seems to do the auto-shutoff right as I'm about to use it. So I needed to fold and unfold it to get to read again. 4. I bobbled it. And dropped it right into the hot oil. I'm staring at it bubbling away in the oil! 5. It took me about 20 seconds to find an implement with which to fish the Thermapen from the hot oil. 6. After letting it cool, and cleaning off the oil that accumulated on it, it appears to work fine. I checked its accuracy against boiling water and and ice bath, and it still seems accurate as well. My favorite article is the knife review because that is how I came to know Cooking for Engineers and I have enjoyed it thouroughly ever since. Thanks for your great work! The Garlic Roasted Potatoes remain in my cooking rotation years after discovering your site. My favorite article? Ah, there are so many, and t's a tough call, but I'd have to say that my favorite CfE article was your Beer Can Chicken article. A thorough examination of this nee-redneck staple, peppered throughout with doses of humor made this one stick out in my mind. Can I have my Therma-stuff now? Love the Chicken Pot Pie recipe. Through there are many things on here that I have made for my family. Tempering chocolate. Which of course, I did not think to read before I decided to melt the chocolate to make a huge batch of chocolate covered desserts. I really dug the Knife review article (http://www.cookingforengineers.com/article/129/Chefs-Knives-Rated). You need to post more! Thanks for all the great comments and feedback. One of the difficulties I have with writing new articles is that I like them to be complete and well tested... unfortunately, with my busy schedule, I often end up not being able to finish testing to my satisfaction or hit a roadblock that derails the writing of an article. I have a couple dozen draft articles in various stages of completion (and another dozen or so restaurant experiences), but carving out enough time to finish them has been a problem for me. I promise that I'll try to set aside that time (or at least try really hard). I did want to mention that I saw that <b>Thermoworks is running a special right now on their infrared thermometers that looks like a pretty good deal for anyone interested in that: Thermowork Infrared Thermometers On Sale Until December 5, 2012</b>. Also, they are giving a pocket thermometer away for any orders with subtotals over $79. The pocket thermometer is actually a really good one and excellent to have as either a backup or to give a friend (who you haven't been able to convince to spend $20 on a thermometer but you know really needs one) as a gift. I don't know how long the free thermometer offer will last, but it might be time to buy a Thermapen for yourself (since it's currently on sale) and get a free thermometer. Also, I want to mention that Thermoworks has started an affiliate program and I've signed up. Now, if you buy anything from them through one of my links, a percentage of the sale (I'm actually not sure how much - I should ask them about it) will go towards the upkeep of this site! I'm pretty fascinated by the intro and home-setup posts on Sous Vide, but so far I haven't given it a try. I think my favorite post, and the one that most captivates my attention would be your additives chart. I work in the natural cosmetics field, so I'm familiar with additives commonly used in cosmetics. Some cross-over, but there are so many little titles in packaged food that I find unfamiliar. My curiosity thanks you. Subject: I'd love to get one of these! Any chance I can win? I found your site a few months ago when researching cooking thermometers! So, much to my surprise, you now are giving away the thermometer that is on my wish list. I've probably spent more than the cost of a thermapen on cheap, inprecise thermometers, so now it's time to step up to the best! I really enjoyed reading the knife review! My favorite recipe off this site is for the Toffee - that is my go-to dessert. I also found the knife roll review helpful, Im disappointed I can't get the one you recommend as it seems really great. I'd have to say I love your Simple Tiramisu recipe. Simple, easy to make, but stays true to authenticity (ladyfingers and alcohol!). Many variations of tiramisu now-a-days lack the things that make tiramisu enjoyable to me, caffeine, alcohol, and ladyfingers. It's my first time here, but I'm definitely going to bookmark this recipe! Subject: Just what I need for this Christmas! Too.many.choices! Cooking for Engineers has been in my feed reader for years. What keeps me coming back is the thought process. I'm much more of an offhand by-the-seat-of-my-pants cook and my husband is the polar opposite. CfE reminds me how to explain things I need him to cook. I love the Lemon Bar recipe. If only I could convince my kids to eat them, I could make them more often! And I just added a Thermapen to my wishlist yesterday! I would love to win one! I love the English Toffee Recipe! I had been wanting to make a supply last year for holiday gifts, and didn't find the one I wanted. So a big thank-you! I have been totally excited about the thermopens too!I have been frustrated by my old thermometers, with their inaccuracies. I even melted one. Oh well! Maybe I will be lucky! Thanks for the contest! Would love to win a Thermapen! Admittedly, I'm relatively new to this site so I haven't seen a lot of it yet. But if I had to pick a favorite article (so far), it would be the one that led me to the site in the first place; A Google search for osso bucco led me to http://www.cookingforengineers.com/recipe/200/Osso-Buco and THAT led me to everything else around here. I anticipate much time spent browsing the rest. I was led to your site by your review of Frontera Grill in Chicago! It's one of my favorite restaurants and I've never been disappointed with any of their dishes. I also enjoy reading your recipes. The way you lay out the ingredients and steps is how I also do it. Your step by step photos and commentary are great, too. places to visit in Chicago was a big help. Creamy garlic mashed potatoes, delicious! I'm new to the site and I'm having fun checking it out. I see a great source for ideas! The recipe I keep coming back to is for Marshmallows. It was my first foray into candy making and my entire extended family can't wait for the holidays when I usually whip up a batch of them with peppermint extract and coat them in dark chocolate! My favorite article is "An Introduction to Sous Vide Cooking". Really interesting! Had never heard of this before. My favorite article is the recipe for mulled cider. YUM! My husband made the lime marinated grilled chicken a few summers ago and we have made it many, many times since them. Straightforward, consistent, & delicious. Was fascinated after watching the movie, and i had to learn to make it. The recipe on this website I made for my parents and it was really simple and tasty. I am in love with the style CFE posts recipes: The ingredient list ordered by use and divided by 'Mix" for example. Thanks everyone for all your comments and entering the contest. All entries above this comment will be counted as submissions. Only the first entry for people who commented multiple times will be counted. I'll post the winner shortly. I pulled all 147 comments, removed mine, duplicates, and those where I did not have email addresses (the few guest posts where the user provided identifying information were included but the couple guest/anonymous posts without any information were excluded). The final tally was 136 entrants. I used random.org to generate a random number and it gave me 53 which equated to midnitechef (who was the 53rd qualifying post [and the 57th comment overall]). Thanks everyone for participating - it was a lot of fun! I'm working on seeing if I can get one more giveaway to occur before the month is up through Anolon, so look for that. My thermometers (several) became suspect. So, each was placed in the same bath of boiling water. Large variations were found. Each was calibrataed to 212 degrees. Then I heated some veg oil to 350 degrees as registered on one of the thermometers. At that temperature, the wide variation in the registered temp of each thermometer existed. (The tube thermometer did not agree with the others. So I'm uncertain of its accuracy.) So .... off to the local hardware shop that sells cooking equipment. Purchased three more. Same story. No agreement at 212, calibrated, and then no agreement at 350 degrees. Because of frying timing, the accuracy of the 350 degrees is more valuable. Because of candy making (sugar heating) around 240 degree accuracy would be valuable. My question is: is there some home method for accurate calibration above 212 degrees. I could designate any of several thermometers to be used for specific tasks. Frying has become a real problem and making caramel is iffy. What liquid, as does water at 212, indicate a specific temperature in some manner? This is actually pretty tricky. That's one of the reasons why I own multiple Thermapens (although it doesn't explain why I need as many as I have). When using another thermometer, I compare against a thermapen so see if it is calibrated (for example, for frying oil with a frying/candy thermometer). I double check the thermapens against each other once in a while to verify they are still calibrated (or at least in sync - I assume that if they do go out of calibration it is unlikely that they would all go out of calibration in exactly the same way and same amount, especially since they were all manufactured and calibrated by Thermoworks at different times). I understand that's not a reasonable solution for most people, but if you need accuracy, it might be worth getting one Thermapen as none of mine have gone out of calibration in any part of the range that I work with (32F to about 400F) regularly and it has been somewhere around 8 years since I got my first one. This raises an interesting question which occured to me many years ago. I acquired some 6 or 7 mercury bulb thermometers at a garage sale and wanted to figure out which was the most accurate. So I stuck them in my mouth one by one and recorded each one's reading. Graphed the results and then picked the median. Chances are they could ALL be off, but I figured that was the best statistical approach without a reference point. Chances are they could ALL be off, but I figured that was the best statistical approach without a reference point. Another way would be to take advantage of known temperatures of water at sea level... 32 F for ice water, 212 F for boiling water. Pour 6 oz of boiling water into a large measuring cup with 6 ounces of 10 oz of ice cold water (ice cubes removed!) and it should (briefly) be at 99.5F (probably a little less because boiling water cools rapidly). Use much larger quantities of both to give yourself a larger time window to use the thermometers before the water cools substantially. Hey, that's pretty clever! Didn't occur to me at all. I'd keep the spoils for myself, but share with many a guest to feast at my table. This holiday season, we are making divinity. I cook all year on my big green egg. Some other need always supplants the ability to purchase an adequate temperature gauge -- winter clothes, school supplies. Came here today for a recipe that I've made for years. Thanks. Engineers are hawt. 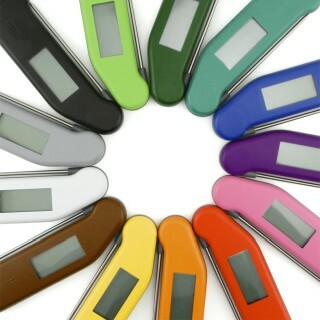 Post a comment on Thermoworks Thermapen and Oven Thermometer 2012 Giveaway!